and enhancing relationships among Tribes, area offices, and Service Unit engineers and related professionals dealing in building health care systems. * Maintaining a priority list based on relative need. * Supporting tribes when they choose to assume facilities-related responsibilities. * Planning health care and associated facilities to minimize facility life-cycle costs. * Planning, promoting, & constructing improvements to exist. Facilities where they are not optimally functional. * Planning & constructing new facilities when existing facilities do not exist or cannot be effectively improved. * Developing state-of-the-art facilities with efficient and effective facilities planning. * Targeting the unmet need with limited resources for maximum effectiveness. To be a Global Health Care Facilities Engineering Division leading cutting edge professionalism in support of Public Health advances and development of solutions to the Indian Health Service challenges. 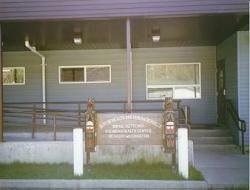 Tribe’s Contract Health Service Delivery Area (CHSDA) is Clallam County. Makah Tribal Health programs include: CHR, CHN, 1st Steps, WIC, Chemical Dependency, Childbirth, Breast Cervical Cancer, Sanitation, EMS, and Mental health. Indian Health Services include: Clinical and Dental services. Other Social Service programs include LIHEAP, Seniors Program, Child Services, Food Bank, Commodities, Education, Juvenile Services, Foster Care, ICW, Domestic Violence, and Juvenile Diversion. The leading causes of death are heart disease, cerebrovascular disease, cirrhosis of the liver, malignant neoplasm, and motor vehicle and other accidents. The enrolled tribal population is 2,356 and the Indian population on or near the reservation is 1,752. There are 4,174 registered users and 3,048 active users in the Neah Bay Service Unit. The Makah were a maritime people who used fish and shellfish and hunted whale. The people used cedar for clothing, basketry, and boxes. The Makah Reservation consists of 27,200 acres of land at the northwest tip of the state bounded by the Pacific Ocean and the Strait of Juan de Fuca. The Makah Tribe is part of the Nootkan culture group, the two other tribes in the group are the Westcoast and Nitinaht tribes of Western Vancouver Island, British Columbia. The Makah is the only tribe in the US to speak a Wakashan language. The Makah had a highly developed representational art style, a stratified social order, and a specialized labor force. There were five major permanent villages in early time; one of them (Ozette) was destroyed in a mud slide and its excavation has produced much knowledge about the culture. A museum curating and displaying artifacts from Ozette opened in 1979. The Makah Indian Reservation is located on the northwest continental tip of the Olympic Peninsula in Clallam County, Washington. The total land area of forty-seven square miles is bounded on the west by the Pacific Ocean and on the north by the Strait of Juan de Fuca. The shoreline of the Reservation is typified by rocky headlands and sandy beaches. There is one large harbor protected by a breakwater at Neah Bay proper, the central village of the Reservation. The Reservation acreage is dominated mainly by rugged mountains, with elevations typically between 500 and 1,000 feet and reaching nearly 2,000 feet at Sooes Peak. There are four major watersheds which drain the main Reservation areas through the following rivers: The Sail, Waatch, Hoko and Sooes Rivers. The flood plains of the Waatch and Sooes Rivers contain the only flat land within the Reservation and are used for livestock grazing. Over 1,000 acres of the land bordering the Pacific Ocean have been reserved as a Wilderness Area. Other reserved areas include land around Hobuck Lake, an area of the forest set aside as a reserve for cedar trees, the entire 719 acre Ozette Reservation, and Tatoosh and Waadah Islands. The remaining land is managed intensively for the production of forest products. Today, Neah Bay is a commercial fishing and timber community, as well as a tourist and sport fishing destination. The climate is temperate, although, in the winter months, winds from the north and east gust up to 100 miles per hour. Average rainfall is over one hundred inches a year. Many visitors come to Neah Bay to tour our world class museum and Cultural Resource Center (MCRC) and hike to the most northwestern point of the United States. The enrollment for the Makah Tribe is approximately 2,300. No other information about offices and programs are available at this time. Total Tribal Employees 60 FTE, with a few contract people, and a few part-time. closest city center is 60 miles away.